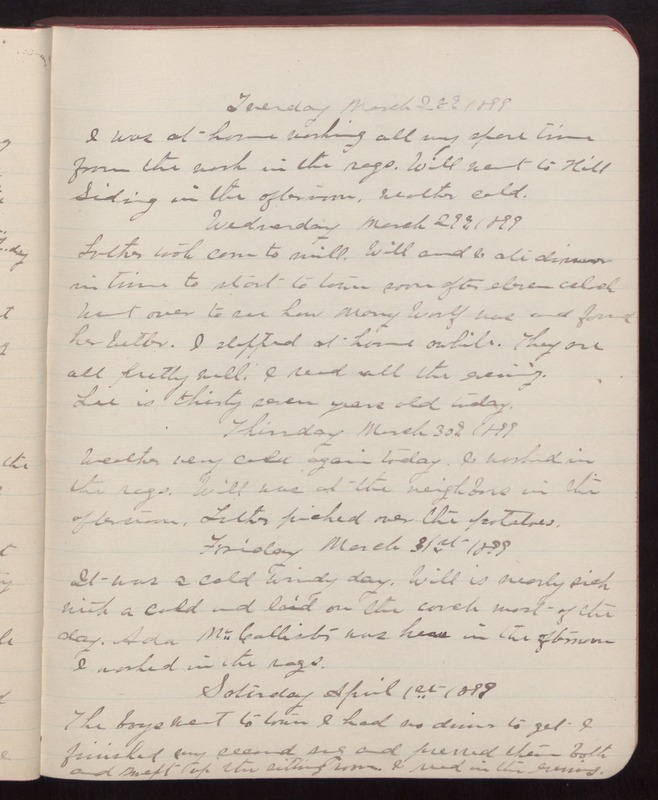 Tuesday March 28th 1899 I was at home working all my spare time from the work in the rugs. Will went to Hill Siding in the afternoon. Weather cold. Wednesday March 29th 1899 Luther took corn to mill. Will and I ate dinner in time to start to town soon after eleven oclock Went over to see how Mary Woolf was and found her better. I stopped at home awhile. They are all pretty well. I read all the evening. Lee is thirty seven years old today. Thursday March 30th 1899 Weather very cold again today. I worked in the rugs. Will was at the neighbors in the afternoon. Luther picked over the potatoes. Friday March 31st 1899 It was a cold windy day. Will is nearly sick with a cold and laid on the couch most of the day. Ada McCallister was here in the afternoon I worked in the rugs. Sunday April 1st 1899 The boys went to town I had no dinner to get I finished my second rug and pressed them both and swept up the sitting room. I read in the evening.